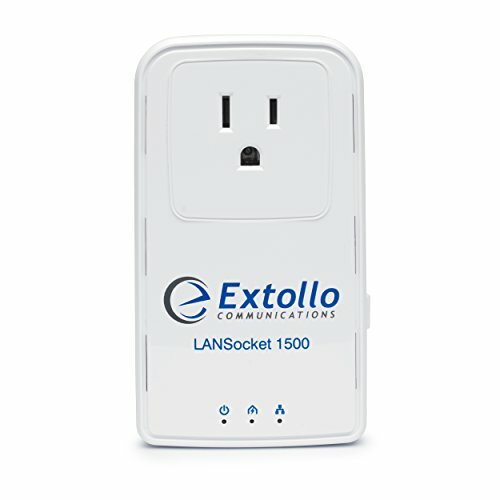 Extollo's LANSocket 1500 HomePlug AV2 MIMO compliant adapters create a self-contained, secure home network using the existing electrical wiring within the home to turn every electrical outlet into an Internet access port. No configuration is necessary, they are ready to go out of the box, just plug them in and network! Quickly and intuitively create a multimedia home network to share residential Internet access among all Internet capable devices within the home. The kit includes, 2 LANSocket 1500's, 2 Ethernet cables and a quick install guide. Product manual is available on Extollo Communications website. NOTE: This is not a wireless product. Performance will vary depending on the age of your electrical home wiring, distance between the LANSocket 1500's, noise on the powerlines and if the powerline signal has to go from electrical phase 1 to electrical phase 2. If you have any questions about this product by Extollo Communications, contact us by completing and submitting the form below. If you are looking for a specif part number, please include it with your message.